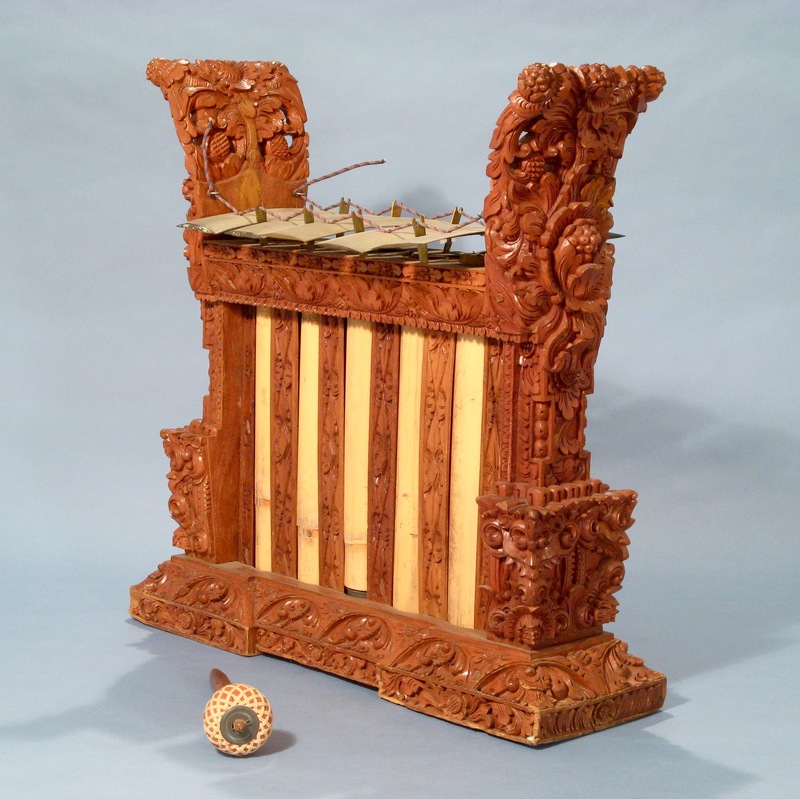 Most Balinese gamelan melodies move in circles. They start with an introduction by the gieng or pemugal, by the suling (flute) or kendang (drum). After the introduction, the orchestra joins in for the pengawak or main melody. This pengawak is repeated over and over again. It may end by just stopping, by branching off to a final line or by a switch to another melody - which then also will be repeated several times. A repeating, circular melody needs structural elements to show the beginning and end or to provide a mark where the melody may be stopped and where a switch may be made. The hanging gongs give this stucture. 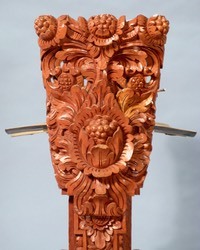 The big gong wadon and gong lanang provide the main interpunction, the medium-sized kempur and the small kelentong give a secondary one. If we call the flow of the music “horizontal”, then in the other direction, “vertically”, Balinese gamelan melodies are built of musical layers that move at different speeds. The slowest-moving layer is the interpunction: the alternation of gong, kempur and kelentong. Next is the melodic layer: the two calung playing the core melodic line, with the two jublag (also called jegog) slowly and majestically accenting every second, fourth, eighth or even sixteenth calung note. On top of that, playing faster again, is the connecting layer. The gieng (or pemugal, depending on the type of orchestra) takes the melody played by the calung, connects the notes by playing ligatures or “slurs” (for instance, by using the construction “ 3 .56 “ to connect a 3 to a 5) and in this way creates a new melodic line. The suling and rebab use the same technique. In the fast lane we find the gangsa, the kantilan and the reong. These instruments provide the figuration layer. The figurations may vary, but they follow a number of fixed patterns. These patterns, in their turn, provide ways of playing around the core melody and returning to it at regular intervals. In Balinese dancing, the flow of the dance and music is at certain points interrupted by sudden accents and stops. These accents are called “angsal”. Especially in those dances that have a fixed choreography - generally the dances in which the orchestra leads the dancers and in which the dancers are quite often small girls - the angsals have fixed patterns. These patterns are found in all dances of the Legong family, such as Legong itself, Panyembrahma, Margapati, Penggak Sama, Tamulilingan, Tenun etc. An outline of the angsal patterns is given in the document on angsal playing. Questions? Remarks? Suggestions? Use the contact form!